Brothers by blood, enemies on the field. North Korea and South Korea clash in a life-or-death tie at the East Asian Championship. Can the South rebound from a disappointing draw against China to set up a potential final against Japan, or will the North avenge their last-minute defeat to Japan against their southern neighbours? It’s the Korean Derby. 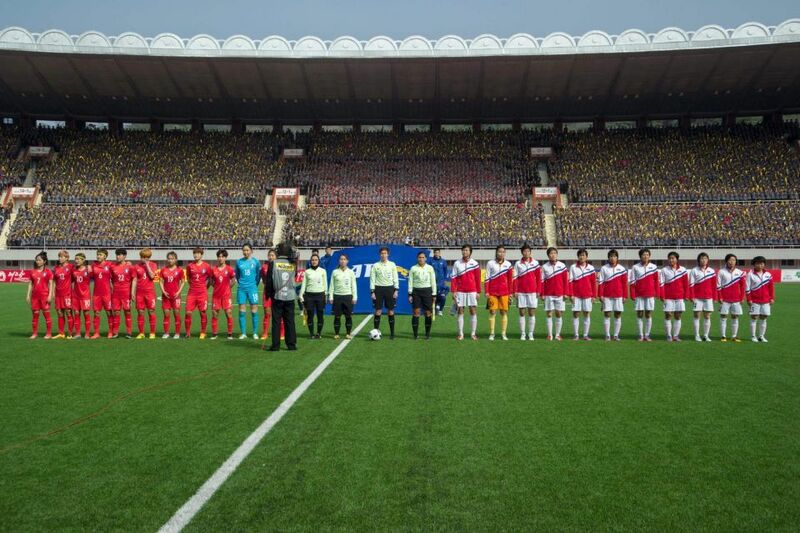 South and North Korea women play in Pyongyang earlier this year. The game finished 1-1, and South Korea qualified for the next phase of women’s qualifying at the North’s expense. Korean Derbies are always a fascinating encounter. In 2009, Kim Chi-woo’s fortunate free kick goal saw the South win their first game against the North after three successive draws in the qualifying phase. In 2014, while the women celebrated together as the South won bronze and the North won Asian Games gold, the men were involved in a tense fight for military exemption fraught with physical altercations, cheap fouls and a whole lot of muttered threats, and the South eventually running out winners in Incheon with a dramatic 120th minute goal by Rim Changwoo. At the East Asian Cup in 2015, Ri Myong-guk’s tenacious goalkeeping kept a flowing South Korean attack at bay. Earlier this year, the South Korean women won their qualifying group in Pyongyang, stunning a crowd of 100,000 at Kim Il-sung Stadium by eliminating the North with a 1-1 draw in their battle. This time around, both countries are looking for redemption, with the South licking their wounds after conceding two poor goals to China, and the North bruised by conceding in the 93rd minute in Tokyo. On the backdrop of political tensions and pride and honour on the line, will it be the South or the North to claim victory in Japan’s capital? Lee Jaesung celebrates his goal against China in the 2017 E-1 Championship. The game finished in a 2-2 draw. South Korea: As mentioned the South Koreans opened the tournament to China looking to better that 1-0 loss in Wuhan earlier in the year. It wasn’t to be, however, as Choi Chul-soon, Jang Hyun-soo and Kwon Kyung-won put in shockingly passive defensive displays against a Chinese side that didn’t get a plethora of chances but certainly capitalised on individual mistakes. If it wasn’t for a good reaction save by Kim Jin-hyeon in the 75th minute, the Chinese could have claimed another victory. Manager Shin Tae-yong expressed his disappointment at the defense post-match, but also went on to praise the whole team effort, going as far as saying “that the team played remarkably well, but only for 70 minutes”. And perhaps there is some truth in that statement. Lee Jae-sung got himself a man of the match award, and deservedly so, after garnering a goal and an assist. The Jeonbuk midfielder was a constant threat on the right side and continued to show his quality with deft passing and incisive runs – his usual strengths. Meanwhile, Kim Shin-wook scored with his feet (!!) in what was a generally good performance for the Wookie as well. North Korea: Traditionally North Korea are known for their stoic defense and well-organised play, and they were no different against hated rivals Japan in their opening game. In truth, their respect of Japanese dominance (only natural, given the gulf in quality) paid dividends all the way up to the game’s finale. For a good 90 minutes they had a fair share of the chances, and actually should have won it late, with Pak Myong-song skying a one-on-one chance and Switzerland-based Jong Il-gwan with two opportunities from close range both stopped point-blank. Gamba Osaka’s midfielder Yosuke Ideguchi scored in time added on after extra time to win the match for a Japanese side who arguably didn’t deserve more than a point from the tournament opener. For those not familiar with North Korean football – don’t worry. No one really, truly ever is. The side is largely composed of domestic league based players (The DPR Korea League) with a handful of players in the lower Japanese leagues (as Zainichi) or a couple players sent abroad into obscure European leagues, with Jong Il-gwan at Luzern in Switzerland, and midfielder Myong Cha-hyon at Radnicki 1923 in Serbia. Perugia’s Han Kwang-song was not available for selection. North Korean manager Jorn Andersen, the first ever foreign manager of the North Korean national team. North Korea need a point in their final game against Hong Kong next March to return to the Asian Cup after a tricky qualifying phase. North Korean football seems to be going under some sort of reformation phase – perhaps this is a story for a different article, a different time – but the hiring of Norwegian manager and former Mainz boss Jorn Andersen seems to suggests a desire for upheaval. North Korea never built on that famous World Cup qualification in 2010, because despite humiliating defeats to Portugal and Cote d’Ivoire, the very fact that the hermit kingdom managed to qualify with a squad of little talents should have been a sign of encouragement. (Asian debutants at the World Cup have never fared well on their first try, anyways.) But they failed to qualify for the 2014 World Cup, crashed out without making a sound of the 2015 Asian Cup, struggled in World Cup qualifying and crashed out after a collapse in the Philippines. Whether it’s the Norwegian boss who brought change, or change that brought the Norwegian boss, we may yet never know. But the DPR Korea League has gone through some sort of a revolution, establishing a clear home-and-away schedule for what appears to be the first time in its history, and a domestic league running year-round from December to October. Furthermore, we know now thanks to Andrew Keh’s brilliant work published in the New York Times that the North Korean football federation is trying to send more and more talents over to Italy and other European countries in an effort to further develop their players, though sanctions and political tensions may be jeopardizing that effort. The present-day North Korean squad is no easy challenge. They look cohesive as a unit, though not without several wrinkles. They seem to be trying a more progressive approach, but defensive stability (5-4-1/5-3-2) against Japan shows that parking the bus remains their bedrock go-to against tougher opposition. Going forwards, they showed their threat on the counter-attack, but also using wide midfielders and wingbacks to send in deep crosses whenever possible. Given South Korea’s malaise on both the counter and in the air, one would not be unreasonable to expect a similar style of play from Jorn Andersen’s men. As is often the case in matches like these where experimentation and rotation are probable with a diluted player pool, it’s difficult to see what kind of approach South Korea will take to the match. Against China, it was on paper a 4-2-3-1, but on the pitch whilst defending more of a 4-4-2, as seen against Colombia and Serbia. Unfortunately there were gaps in the midfield, the breakout play wasn’t very well structured and defensively players were too keen on expecting their teammate to do the work and be left ball-watching. South Korea could elect to stick to a 4-4-2 as their standard defensive shape – the ultimate goal is World Cup success, after all – but will have to be more progressive, as games between these two sides tend towards 0-0 draws (3 of the past 5 clashes were 0-0 draws, and no team has scored more than 1 goal in this fixture in 12.5 years). 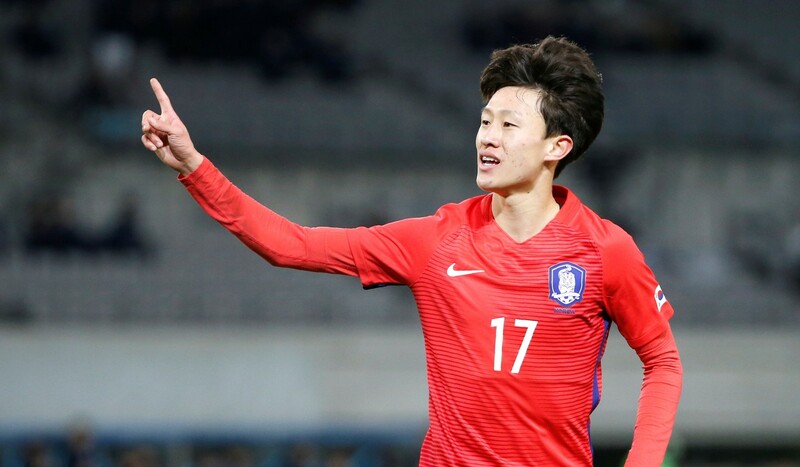 Given that only three days have passed since the game against China, you can expect some rotation from Shin Tae-yong, but you can have no doubt that the ultimate aim is a tournament win, and that might only be accomplished if there is a winner tonight. South Korea has more quality than the North, but the North are more of a team unit. Boiled down to a simple sentence, this is the truth about the match. Nothing can be taken for granted, and the defense will have to contend with aerial threats and stay focused for the full game’s duration. Unfortunately, South Korea’s precedent over the years hasn’t been very good in that department, and the North Koreans look better than expected, so we’ll go for a 1-1 draw. Defense, let’s see some defense please.